What’s that saying?! April showers bring May flowers? 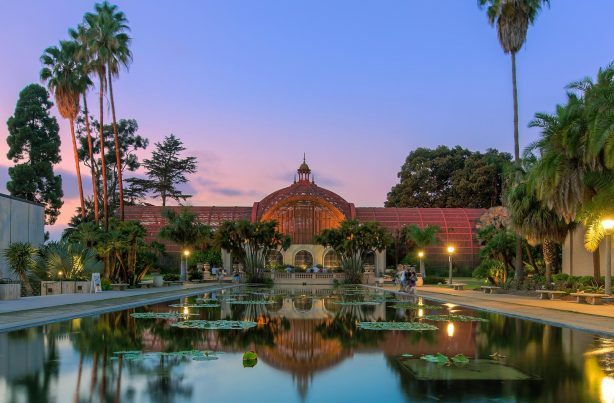 Well, regardless of what the weather will bring this month, there is one thing we can guarantee—no one will be raining on your parade when it comes to things to do in Balboa Park. The options are endless at Balboa Park this month: classic tales coming to life on stage, photography workshops, wine history, bloom bashes, craft brew tastings coupled with arts projects and more! It’s safe to say we are all familiar with the beloved, rags-to riches fairy tale of Cinderella. As the clock strikes midnight on April 3, you can watch this whimsical story come to life through the San Diego Civic Youth Ballet. Featuring the fanciful music of Prokofiev and timeless beauty of ballet, the rendition of this timeless tale will dazzle audiences of all ages at the iconic Casa del Prado Theater. Tickets range between $12-$18. It could be said that the two basic elements in photography are light and time. Historically, the light used to make a photograph came from the most common light source we know—the sun. Join MOPA in exploring the parallels between solar technology and the origins of photography using basic chemistry, water, and, of course, the sun. This solar expedition takes place from 10:00 to 11:30 AM, and, best of all, it is completely free. The story of the famed 1960s “Mercury Seven” is explored in the vividly theatrical premiere of They Promised Her the Moon. This play tells the unknown (true) story of an exceptional and unjustly overlooked woman who was excluded from the Original Seven’s trip to Mercury despite having out-performed her male counterparts. Take the journey of Jerrie Cobb’s story beginning on April 6 at The Old Globe. Tickets start at $30. Enjoy Balboa Park’s Jewel Box—the Timken Museum—for all the right Rieslings. Join Rod Phillips, discussing the role wine played in the lives and art of the Old Masters. Of course, no wine discussion is complete without a proper tasting of local region wine. Tickets for this wine-derful evening range between $65-$85. The Museum of Art’s signature fundraiser and annual exhibition is back with nearly 100 floral interpretations of the works of art on view. Jennifer McGarigle—the 2019 Rotunda designer—will transform the museum into a large, all-encompassing floral installation. In addition, you can find interactive projects designed for children and parents alike in the Garden of Activities. Tickets are $5 for youth and $25 for adults. Come enjoy an evening filled with arts and craft – beer that is – in the always picturesque Spanish Village Art Center in Balboa Park. Check out the work of the village’s more than 200 resident artists or make some art of your own with lessons in painting, pottery and more. There will be unlimited tastings from some of San Diego’s best craft breweries—Automatic Brewing, Boochcraft, Burning Beard, Mike Hess Brewing Co. and Stone Brewing—and delicious bites from the Prado and the Cohn Restaurant aGroup. Pre-sale tickets are $35 or $45 at the door. This entry was posted in Museums by Jennifer Davies. Bookmark the permalink.